Words in history: mirrors or motors? Some years ago I wrote a book devoted to the history of a single philosophical keyword, ‘altruism’, coined by the French philosopher and sociologist Auguste Comte in 1851. It was my first foray into the cultural history of philosophy. Partly inspired by this previous project, I decided to include a series of posts on the Cultural History of Philosophy blog on ‘Philosophical Keywords’ – short essays on the histories, meanings, and significance of words that have crossed over from philosophy into broader culture. Unsurprisingly, I chose to write the first post in this series on ‘altruism‘. Other keywords will be written about by others, including students taking the ‘Philosophical Britain’ module at Queen Mary. In the first chapter of my book about altruism, I set out my thoughts about how to approach writing the history of a word. The post below is a short and slightly modified extract from chapter 1 of The Invention of Altruism: Making Moral Meanings in Victorian Britain (Oxford: Oxford University Press for the British Academy, 2008), and is reproduced here with the kind permission of the British Academy. In the twentieth century, other writers adopted Trench’s idea that words could bear testimony to past realities; that they could act as witnesses. Two members of the Oxford group of writers known as the Inklings, C. S. Lewis and Owen Barfield, both wrote historical studies based on the same central idea. Barfield, in his History in English Words, first published in 1926, compared the English language, along with the other languages of the world, with ‘an imperishable map’ which ‘has preserved for us the inner, living history of man’s soul’. His friend C. S. Lewis’s Studies in Words, first published in 1960, and based on lectures given to Cambridge students in the 1950s, consisted of a series of essays on words chosen for ‘the light they throw on ideas and sentiments’ that prevailed in past societies and as an ‘aid to more accurate reading’ of the literature within which they were used. The words chosen included ‘nature’, ‘wit’, ‘simple’ and ‘conscience’, and were illustrated with a wealth of examples from philosophical, literary, and religious works in classical, medieval and modern languages. Although Lewis claimed that his studies were ‘merely lexical’, they in fact shed considerable light on historical matters; and Lewis took a particular interest in the social and moral status associated with certain uses of key words. His essay on the interrelated connotations of ‘free’, ‘frank’, ‘villain’, and ‘liberal’ is a particularly good illustration of this approach. Historians of modern Britain and its language have noted that the eighteenth and nineteenth centuries, with their dramatic industrial and scientific transformations, saw the English vocabulary expanded and enriched by a wide range of new terms. Eric Hobsbawm opened his study of the Age of Revolution with the observation that ‘Words are witnesses which often speak louder than documents’, and went on to mention ‘factory’, ‘railway’, ‘scientist’, ‘proletariat’, ‘Utilitarian’, ‘sociology’, and ‘ideology’ as examples of key English words which ‘were invented, or gained their modern meanings’ in the period between 1789 and 1848. Their importance for Hobsbawm was as pointers to the arrival or transformation of ‘the things and concepts for which they provide names.’  The French linguist Georges Matoré, writing in the 1950s, made a distinction between mots temoins and mots clés – witness words and key words. The former category consisted of neologisms arising from material, technological, social or intellectual changes or turning-points. The terms on Hobsbawm’s list would fit into this category. Key words, on the other hand, for Matoré, were words that captured the leading idea or sentiment of a whole society or period. He suggested prud’homme and philosophe as early modern French key words. The most influential study of witness words and key words in the English language has undoubtedly been Raymond Williams’ 1976 book, Keywords: A Vocabulary of Culture and Society. Williams explained that, on returning to Cambridge after the war in 1945, it seemed to him that the whole vocabulary of the place had changed – that people were speaking a different language. He heard the word ‘culture’ much more often, for example, to signify a cluster of values or a way of life. The resulting study, eventually completed thirty years later, was an alphabetically arranged dictionary of key words in modern English, such as ‘art’, ‘bourgeois’, ‘charity’, ‘democracy’, ‘elite’, ‘family’, and so on. Each entry offered etymological, historical, and semantic reflections on the developing definitions, connotations, and significance of the chosen words. Williams himself struggled to classify his book but suggested it might be considered a contribution to cultural history, historical semantics, literary history, sociology, and the history of ideas. When I refer to ‘altruism’ as a ‘key word’ in this book, I intend something closer to Williams’ quite broad sense of that term than to Matoré’s more ambitious idea of a mot-clé. Many of the suggestions surveyed in the previous paragraphs inform The Invention of Altruism in quite obvious ways. 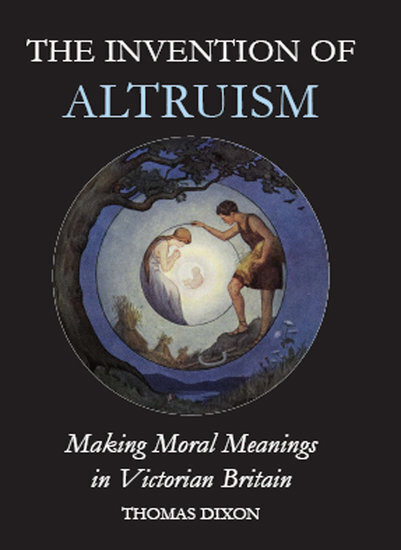 ‘Altruism’ could be described both as a witness to significant shifts in the sources of moral authority, and also as a key word that captured some of the most characteristic sentiments and ideas of the Victorian period. The pattern of its dissemination from its Comtean origins, via the writings of a small group of intellectuals, into a wide and various range of other texts, in which it took on multiple meanings, could be thought of as constituting a map of intellectual and social connections. I hope to go somewhat beyond these characterisations, however. While it is useful to think of words as witnesses to historical transformations, and of linguistic change as a map or mirror of social change, metaphors such as these are very passive. They rely on the idea that real historical change is material, social, political, technological, or even emotional and intellectual, and that we can map or track such fundamental change by looking at linguistic change, which is then little more than a marker or by-product. These passive metaphors can be supplemented by more active ones. Barfield 1954, 14; quoted in G. Hughes 1988, 1. C. S. Lewis 1967, vii. Ibid., 67-70; see also G. Hughes 1988, 24-5; G. Hughes 2000, 30-2. Ibid., 11. A recent, multi-authored volume, directly inspired by Williams’ 1976 book, is New Keywords: A Revised Vocabulary of Culture and Society. It includes ‘alternative’, ‘biology’, ‘celebrity’, ‘deconstruction’, ‘ethnicity’, ‘fundamentalism’, and so on; Bennett et al. 2005. This new volume seems generally to put rather less emphasis than Williams on historical semantics and more on cultural and social theory. This is the model that I tended to favour myself in my study of the transition from theories of ‘passions’ to theories of ‘emotions’ in the nineteenth century. Dixon 2003, 249-51. My approach here is similar to Neil Kenny’s. He has written that his approach to the history of the language of ‘curiosity’ is ‘designed to replace any approach that would see language as a mere epiphenomenon of underlying social, cultural, or intellectual contexts, as a mere “effect” that is “caused” by them.’ Kenny 2004, 24. Barfield, Owen (1954). History in English Words. New edition. London, Faber and Faber. Bennett, Tony, et al. (eds) (2005). New Keywords: A Revised Vocabulary of Culture and Society. Oxford, Blackwell. Dixon, Thomas (2003). From Passions to Emotions: The Creation of a Secular Psychological Category. Cambridge, Cambridge University Press. Hobsbawm, Eric (1973). The Age of Revolution: Europe 1789-1848. London, Cardinal. First edition 1962. Hughes, Geoffrey (1988). Words in Time: A Social History of the English Vocabulary. Oxford, Blackwell. Hughes, Geoffrey (2000). A History of English Words. Oxford, Blackwell. Kenny, Neil (2004). The Uses of Curiosity in Early Modern France and Germany. Oxford, Oxford University Press. Lewis, C. S. (1967). Studies in Words. Second edition. Cambridge, Cambridge University Press. First edition 1960. Matoré, Georges (1953). La Méthode en Lexicologie: Domaine Français. Paris, Didier. McKusick, James C. (1992). ‘“Living Words”: Samuel Taylor Coleridge and the Genesis of the OED.’ Modern Philology 90: 1-45. Skinner, Quentin (2002). Visions of Politics. Volume I: Regarding Method. Cambridge, Cambridge University Press. Trench, Richard Chenevix (n.d.). On the Study of Words; and English Past and Present. Everyman’s Library. London, J. M. Dent and Sons. First edition 1851. Williams, Raymond (1976). Keywords: A Vocabulary of Culture and Society. London, Croom Helm. This entry was posted in Philosophical Keywords and tagged altruism, Georges Matore, keywords, Neil Kenny, OED, Quentin Skinner, Raymond Williams on December 28, 2014 by Thomas Dixon. Have the British finally learnt how to express their emotions?